If you ever feel the need to blackmail me–Lord knows you wouldn’t be the first–you may find this photo of me willingly palling around with Seth McFarlane characters helpful. 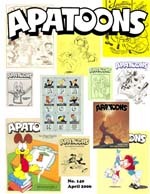 It’s startling just to think about it, but Apatoons is celebrating its 25th anniversary with its new issue, #140. With a circulation of about 30, it has one of the smallest readships of any publication on animation–yet it’s also the longest running, most distinguished discussion about the art form that ever existed. At a conference I attended earlier this week, they served corn dogs at a snack break. An attendee from Australia was momentarily confused, and said he didn’t know what a corn dog was. But when he saw them, his eyes lit up and he revealed that Australians call a hot dog with a cornmeal batter a “Dagwood Dog.” And yes, it’s a reference to Blondie’s husband. While researching this tidbit at Wikipedia, I discovered that Australians also call corn dogs “Pluto Pups,” and that our Canadian friends call them Pogos. Is there a tradition we don’t know about in the U.S. that these things should have names that pay tribute to great cartoon characters?